Since Imran, Tom and myself started working on the Pararchive project back in October 2013, its working title has been something of a running joke. While it worked as a reminder of what the project aimed to achieve (a ‘parallel archive’ of individual, rather than institutional, commentary on archival material), it was clumsy shorthand. Besides, everyone on the project pronounced it slightly differently. The entire project is based on the notion of co-design – working with groups of what you might call end users, to help define needs, and then answer them. One of the outputs of the project will be an online service that allows people to construct interweaving tapestries of simple stories, using their own material, as well as that provided by our archive partners. This output has been driven by our co-design workshops, and aims to reflect and honour the viewpoints of those who have donated their time to the project. We needed a name and brand for the service that would represent that process. Now, co-design does not mean ‘design by committee’. It’s about involving people in the very early stages of the design process, gathering and interpreting their opinions and actions, and creating something that best suits it. That’s how we’ve built the prototype service so far, and is how we approached the brand design aspect of the project. We looked back over all our workshops, reflected on how the project has mutated over time, and expressed that through design. We didn’t ask any of the delegates on the project to come up with names, or sketch logo ideas. That’s not to say they couldn’t create something great, but that isn’t what co-design is. 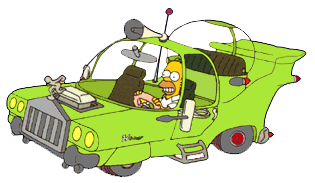 Nobody wants Homer Simpson’s car. Contrary to what we originally expected, the service is less about trawling and extracting items from archives. People are much more interested in telling stories. Sure, archival material will support that, but without a story behind it, the items lose meaning. Neither is the service strictly about writing canonical truth. It can be, but it is just as much about personal opinion, and even myth. The service could also be used to write fiction, and I do hope it is. So whether a story seeks to clarify facts, delve into history or local legends, or be completely fanciful, we needed a name that encourages all of this. We also wanted it to be open and inviting to novice users of the web. There are plenty of services, such as Cowbird, Storify or Medium, that already allow you to write stories online. We love them all, and they’ve definitely informed what we are building, but we want to feel like our service could allow people to take their first steps into sharing stories and information, in an open but safe environment. So we have decided to call our service Yarn. It’s launching this Spring, and we hope you will come and make stories with it.